Abstract: This article compares ideological production in the Burgundian sources with the Ottoman sources and ascertains that there was a contrast in their respective treatments of the battle of Nicopolis (1396). This event was the first major encounter between the Ottoman Empire and the Western European states of the later Middle Ages. A paradox can be observed between the Burgundian sources on the one hand and Ottoman chronicles on the other : in the Burgundian sources, there was an explosion of narratives concerning this battle in this way, the memory of the defeat at Nicopolis developed into a genuine historiographical patron and literary myth on the ‘ barbarian Turk’. In contrast, Nicopolis was not considered as a key event in the Ottoman historiography. The Ottoman chronicles paid little attention to this event. This paradox between French and Burgundian accounts and Ottoman narratives are situated within distinct retrospective trajectories of state building and accompanying ideologies. 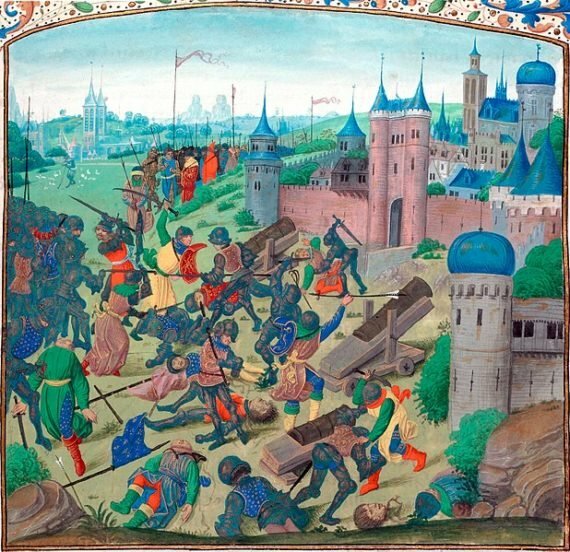 Introduction: This article analyzes Ottoman and Burgundian narratives dealing with the Battle of Nicopolis (25 September 1396), an event regarded in Western historiography as one of the ‘later crusades’. Nicopolis was the ﬁrst major encounter between the centralizing Western European polities of the later Middle Ages and advancing Ottoman power. In 1396, an allied Christian army of mostly Burgundian and French troops was dispatched to aid the Kingdom of Hungary against Ottoman expansion into Eastern Europe and satisfy Byzantine demands to relieve Ottoman pressure on Constantinople. Byzantine Emperor Manuel II (1391-1425) also sent soldiers, while Venice and Genoa supplied a naval ﬂeet to support the action. It was the ﬁrst time that a large, united European force took the ﬁeld against the Ottoman army that had been building up its reputation in the West for some time. The crusaders suffered an absolute defeat at the hands of the Ottoman forces under Sultan Bayezid I (1389-1402). In spite of Bayezid’s defeat by Timur Lenk in 1402 and the ensuing Ottoman civil war until 1413, when Mehmed I took the throne, European powers were too weak to exploit this political turmoil in the Ottoman Empire.